Square Enix has confirmed that Final Fantasy VI will be coming to Steam. In fact, it's already there, you just can't play it until December 16. Originally released in 1994 for the SNES, Final Fantasy VI follows the adventures of a group of rebels who seek to overthrow the Imperial rulers of a steampunk world in which the once-powerful force of magic has faded into distant memory. It was the first in the series to allow players to play as any of the game's main characters, and it remains extremely well-regarded and popular. 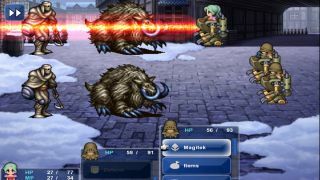 The Steam release of FFVI will feature "painstakingly recreated" graphics done by character designer Kazuko Shibuya, as well as PC-optimized updates to the controls and "active-time battle system." As you'd expect, it will also support Steam achievements and trading cards. Word of the PC release of Final Fantasy VI actually came to us yesterday, when a list of games purportedly on the way to Steam slipped out of the SteamDB. That list was, and is, entirely unconfirmed, but clearly it was at least partially right. And not just for FFVI: Another game on the list, Guilty Gear Xrd Sign, is coming to Steam tomorrow. So that's two games we can check off of that list, and you know what comes after two, right? Say it with me: Confirmed. And now, dig some screens.